This game concentrates on your ability to recognize and understand spoken English. Topic audio is played which you must match to the correct picture. This will improve your ability to recongnize spoken English words, phrases and short sentences without the help of the written text. This is a vital skill in mastering basic English and being able to use it in real life situations ( like talking to English people in English !! ). 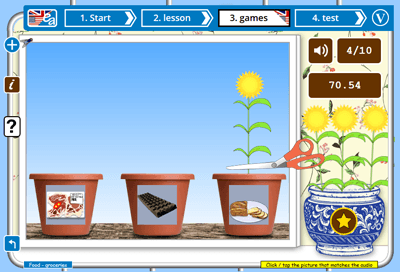 Sow grow is a one player game to learn or revise spoken English. The first seeds are planted and the first English audio is played.